Law Enforcement K9 burial ceremonies at the MWDM. In addition, the Patrol has marched in local parades since 2012 to honor our country’s Working K9s . 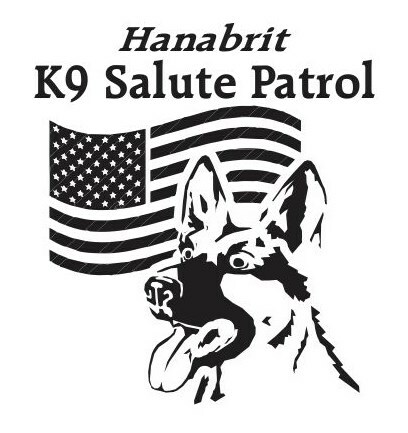 A working dog team is a partnership, and to that end the Hanabrit Salute Patrol has decided to begin offering our services to the families of Military and Law Enforcement K9 Handlers. Whether it is a group howling salute, a lone howl in the distance after Taps, a canine standing guard near the grave site, or canines offering “hug therapy” to family and friends, we would be honored to serve the memory of your loved one. MWD Buddy E154 - Buddy, a Chesapeake Bay Retriever, was a TSA explosive detection K9. He has left an enormous hole in my heart that constantly aches to see him, hug him and be at his side. I only pray that I was worthy of his devotion and the incredible love he gave me. The thought that helped my aching heart is that he is now totally healed. No longer in pain. He can run and run to his hearts desire. But the one thing I am SURE of is that Heaven has a new angel guarding its gates and that one day we will be reunited because our time together on Earth was much to short. MWD Mina F735 After 9 tours in Afghanistan and two in Bosnia, our Military Hero has crossed over. He led a good life and our son who I am very proud of, deserves to have his dog recognized. Mina will always be in our hearts and soul. And it is with great pride that he was a part of our family history. Hopefully he will be talked about for a long time. K-9 Alex, Novi Police Department's K-9 Unit. 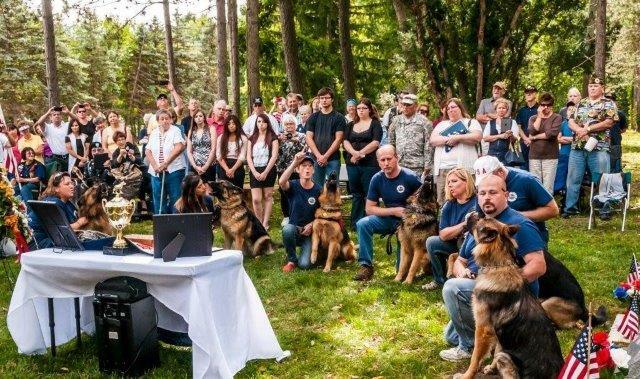 He was certified as a narcotic detection, tracking, building and article search and patrol dog in 2008 and assigned to the Novi Police Department's K-9 Unit with handler Officer Robert Manar. On April 18, 2014 K-9 Alex died in the arms of Officer Manar. MWD Chyan D233, He was certified as a explosive detection, scout, tracker and patrol dog. In 2002 he was assigned to "Special Ops" and from this date to 2010 his service records was unattainable. What is known, is that during this time frame MWD Chyan was positioned in many areas of Europe, he was in Antwerp, Belgium, Germany, Bosnia, in and out of Iraq and Afghanistan several times. MWD Shaman-H055 He was certified as a PNDD (Patrol Narcotic Detection Dog) with his handler Sgt. Asher. In 2006 Sgt. Asher competed in the FORCOM Working Dog Trials. Shaman always scored high and was "Top Dog" in narcotic detection. In mid-2006 Asher and Shaman were deployed to Iraq at one of Iraq's high profile prisons. While in Iraq they were on call to assist American and British Special Operations Forces in Southern Iraq. July 21, 2014 Shaman passed away. K9 Quinn, He was certified in Narcotic detection, Handler protection, Tracking, Building search, Area search, and Article search. K9 Quinn and Officer Soli were assigned to the Fowlerville Public Schools as liaison Officers. Over the years K9 Quinn had several narcotic finds, caught several fleeing felons and assisted every Police Department in Livingston County. K9 Quinn was mostly known for his unbelievable temperament. He was loved and petted by several hundred children in the Fowlerville community. 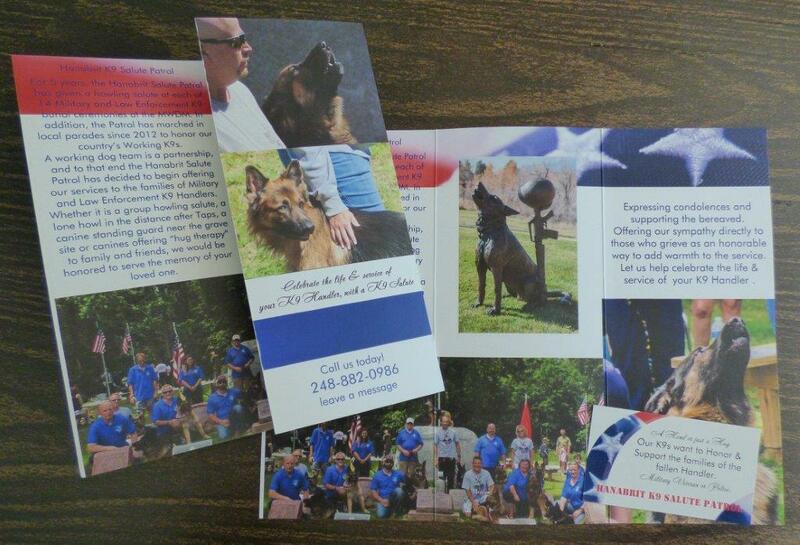 K9 Quinn was sent to heaven on September 02, 2014. He will be missed by many. MWD Pito L590, He was certified as a Explosive Detection Dog, field-certify as a Patrol Dog, then assigned to the USSS (United States Secret Service) and he traveled across the country providing secure travel accommodations for the President and Vice-President of the United States. Pito was deployed to Iraq in support of OIR (Operation Iraqi Freedom). In 2011, he was deployed to Afghanistan in support of OEF (Operation Enduring Freedom) and Pito returned to his home base later that year. Thank you for your service! MWD Bady H163, He was certified with the United States Navy as a PEDD (Patrol Explosive Detection Dog). Bady was deployed to Kuwait, spending several months patrolling for explosives. He deployed to Iraq in 2006, conducting the same duty. During this deployment, he served on several special operations with Navy SEAL Team 5, the 9th Engineering Support Battalion, and the 3rd Battalion/ 2nd Marines, Lima Company. Then assigned to a new duty station: the Naval Air Engineering Group at Joint Base McGuire/Dix/Lakehurst in New Jersey. Bady was again deployed to Iraq and is credited with leading a patrol in the apprehension of 8 personnel on a Time-Sensitive Target scout mission. On another mission, he found (and bit) an Iraqi insurgent hiding in a “spider hole”. While on patrol, he alerted and uncovered 5 weapons, 2 bags of ammunition and a bag of propellant. His MWD Team was awarded The Army Commendation Medal. Those who knew and worked with Bady are very proud of his heroic accomplishments and he will be missed by many. Rest in Peace, K9 Warrior, until we meet again. K-9 Cody, She was a certified “Therapy Dog” and also received the “Canine Good Citizen” award from AKC. MWD Zizi L401, She served in the US Navy from 2008 - 2011. She was deployed once to Camp Arifjan Kuwait in support of Operation Enduring Freedom from June 2009 to June 2010. 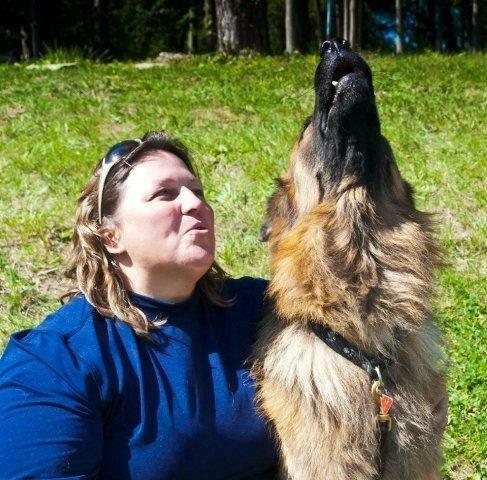 MWD Zizi retired early at the age of six, due to Progressive Retinal Atrophy. She was adopted by her handler MA1 Cristina Collesano in February 2011. Zizi was diagnosed with Cancer in March 2014 and passed away peacefully in Cristina’s arms on September 23, 2014. K-9 Samson, At the age of 11 months, Samson began his Police K-9 training, and after several months, began patrolling the complex. Samson was cross-trained in Patrol and Narcotics Detection and later Nationally certified through the National Association of Professional Canine Handlers. Samson proved so effective at crime deterrent and criminal apprehension that soon a second K-9 team was added, as well as a third, fourth and fifth K-9 team. Being partnered with Handler Tim Przytulski, K-9 Samson began locating narcotics and assisting Southfield Police and undercover units with search warrants and arrests. During one such search warrant K-9 Samson help locate 67 bags of marijuana and a loaded handgun. MWD Spaulding K419 - SSD (Specialized Search Dog) US Army. Deployed twice to Afhganistan with the 3rd & 7th Special Forces. Adopted by handler from Hartland. K9 Axel, K9 Axe of the Southfield Police K9 Unit. Officer Raby and family for the lost of their K9 Hero. His watch is over and may he RIP. The MWDM has become a beautiful place and I am proud to have been apart of it. both Military & Police at thier burials/memorials. 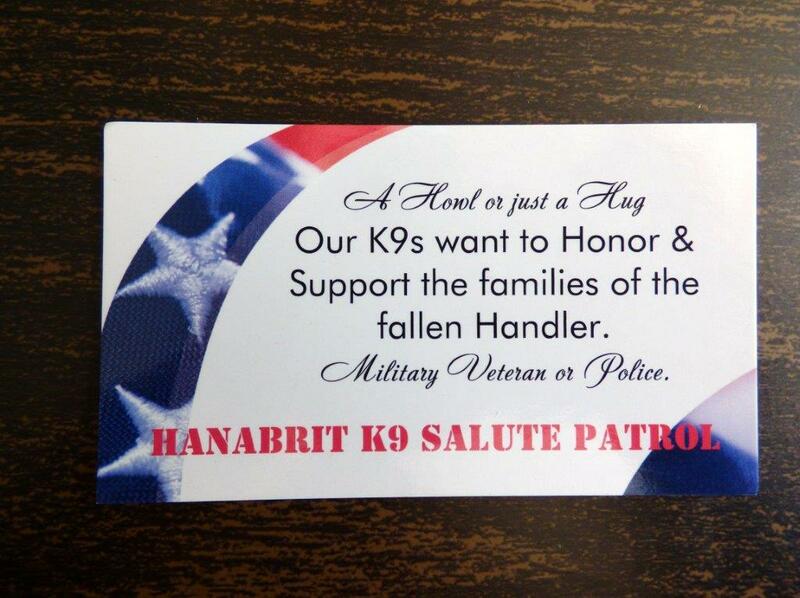 Feel free to contact me for more information regarding our future Hanabrit Salute Patrol endeavors. A little history of the Hanabrit Salute Patrol. Jim & I and a handful of volunteers helped start the huge challenge of clearing the MWDM site that was overgrown & looked like a forest. The original monument wasn't even visible from Milford rd. 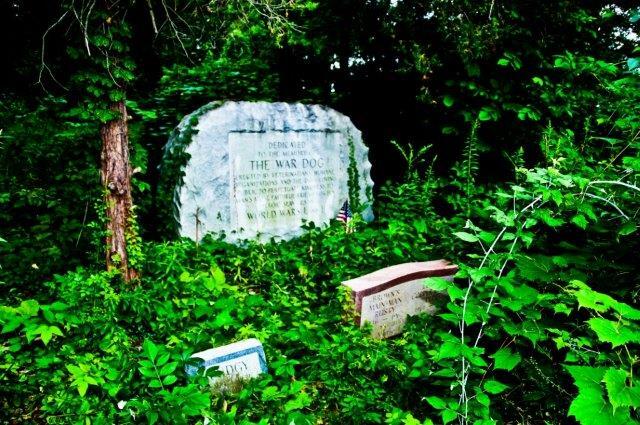 when found in 2010.. Then the real work began, 2 clean ups every summer, catching poison ivy, taking the bbq to feed the volunteers, joining the board to organize this wonderful cemetery. At one of the cleanups in 2011(pic above) Bear gave a howl salute to the volunteers.... then the light bulb went off, lets start a salute patrol for the ceremonies. 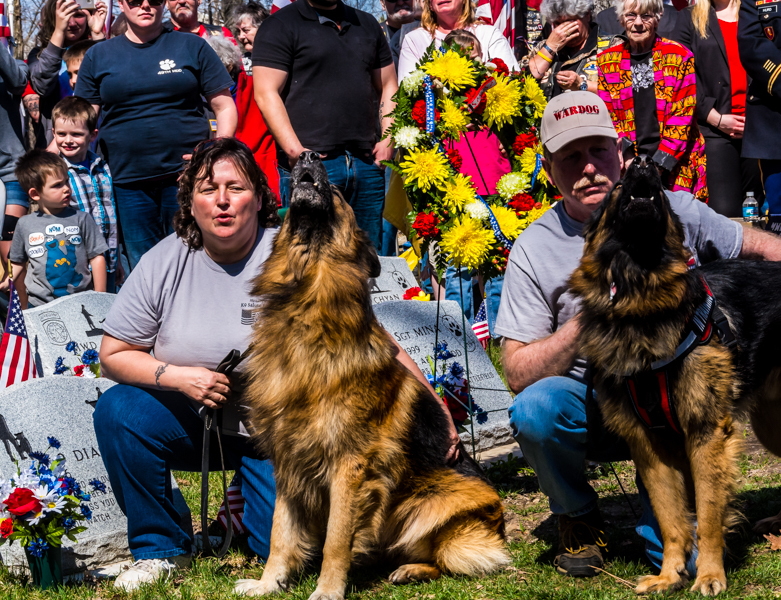 So in 2013, the Hanabrit Salute Patrol gave a Howl to salute their fallen hero (MWD Buddy E154)at the end of the ceremony, which was the first of 14 memorials we participated in. 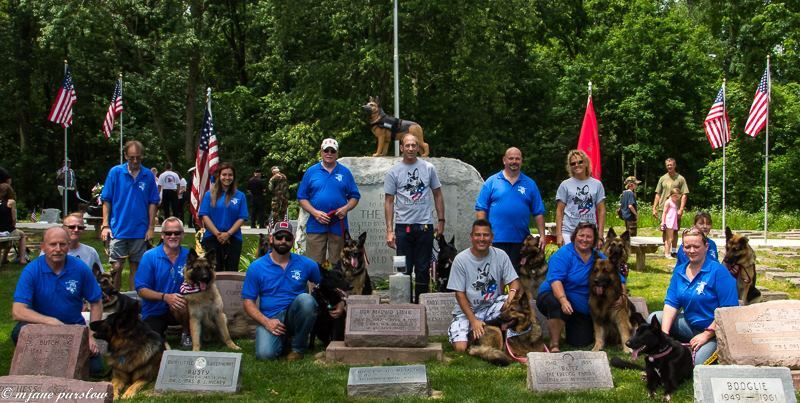 I have been so very proud of our Patrol, you all that have volunteered your time to honor these service dogs. Some of the ceremonies were very COLD or HOT, but we were there. Again the president of the MWDM relieved me of my position; I received a Face Book pm from him stating that Hanabrit Salute Patrol is no longer welcome to participate in their ceremonies. That he is starting a Salute team of his own.